Homecare agency Assisted Living Services presented their first monthly $5,000 Platinum Caregiver Award on March 26. From left, Karen Damaskos; daughter; client Ann Mulready; Sharon D’Aquila, Co-Owner and President; Nana Watson, Platinum Caregiver Award Recipient; Tom Daly, General Manager and Director of Live-In Services; and Mario D’Aquila, MBA-Chief Operating Officer. FAIRFIELD - Glowing reviews of in-home caregivers who provide exceptional care for their loved ones pour into Assisted Living Services, Inc (ALS) each month from grateful families. Now ALS wants to show their appreciation for these employees who are worth their weight in platinum by launching the Platinum Caregiver Award program. Each month, this unprecedented initiative will award $5,000 to a stellar caregiver who has exceeded expectations for quality care. 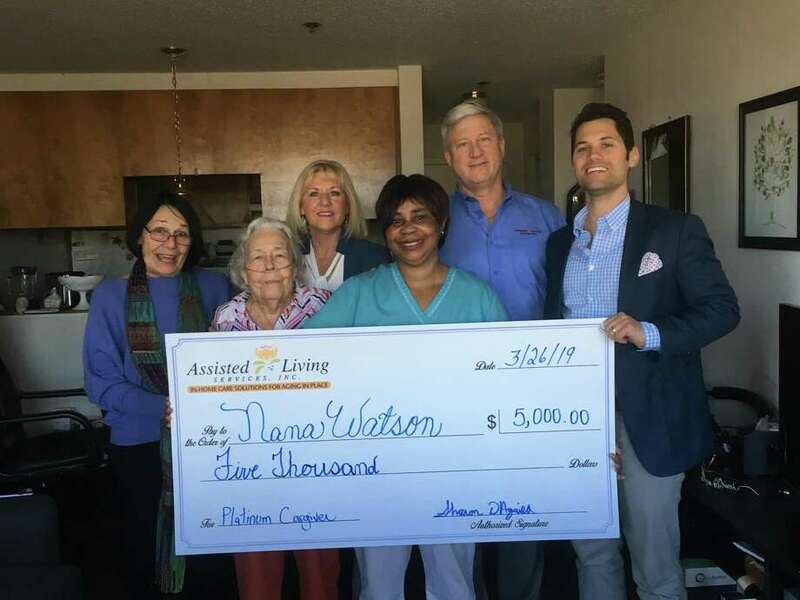 The program’s first honoree, Nana Watson, was presented with the award in a surprise ceremony on March 26 while she was caring for client Ann Mulready at her home. Watson has been with ALS for seven years. For more than two decades, ALS has led the charge to raise the standards for quality of care across the board in the highly competitive homecare industry. The company already gives thousands of dollars each year to incentivize employees for superior performance or perfect attendance. Managers also receive incentives if quality assurance benchmarks are achieved. Incentives and genuine appreciation for staff members are just a few of the reasons ALS has a high employee retention rate with some employees still working for the agency for nearly two decades. In addition to the monetary bonus, the Platinum Caregiver Award includes a beautiful crystal statue and a certificate of merit. To select the winning caregiver each month, ALS clients are called at random by Homecare Pulse, a third party survey company that measures customer satisfaction. Clients or family members will be able to rate the services and quality of care that is being provided. They will have the opportunity to mention caregivers who went “above and beyond” when caring for them or their loved one. Homecare Pulse benchmarks and compares agency results regionally and nationally. The caregiver with the highest quality score will earn the prestigious and well-deserved recognition for their outstanding work. ALS employs more than 400 caregivers across the state, all of whom are insured, bonded, and supervised. Newly hired employees undergo a National Criminal Background Check and eVerify. All of their Personal Care Assistants have attained previous training in a Home Health Aide or Certified Nurse Aide program, or have received specialized training to perform personal care or assist with activities of daily living. Additional training is provided in OSHA, Safety, Alzheimer’s Care, Hospice, Elder Abuse, Customer Service, and more. ALS is currently accepting applications for daily and live-in caregivers. Since 1996, award-winning home care agency Assisted Living Services, Inc. in Meriden, Clinton and Fairfield has provided quality care to residents across Connecticut. Their unique CarePlus program blends personal care with technological safety and monitoring devices from sister company Assisted Living Technologies, Inc. Learn more by visiting www.assistedlivingct.com or calling 203.634.8668.